Fully furnished living area means no one gets relegated to the floor (unless that's their preference). When it comes to tales of the day, embellishment is fair game. The indoor pool's ideal for off-season or just giving bright-pink noses and shoulders a break from the sun. Head out to the court to see who has the fiercer serve. Shoo your crew off to the basketball and shuffleboard courts while you get dinner in the works. Keep your water park fans happy with trips to Water Chute and White Water, both just minutes away. A golfer's paradise, just 10 minutes from Don Gardner Golf Course, and 12 to Pointe Royal. 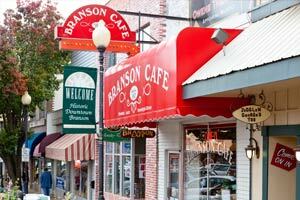 Less than a ten-minute drive to Branson's biggies, like the Titanic Museum and Hollywood Wax Museum. Well-appointed cabins are far from "roughing it," complete with jetted tubs and stone fireplaces. Tucked in among the trees and rolling hills of the Ozarks, but with nearly instant access to Branson’s live entertainment scene, Cabins at Grand Mountain by Thousand Hills Resort gives you the best of both worlds. Inside your well-appointed two-bedroom cabin, you’ll find a fully equipped kitchen, screened or open-air porch, cozy fireplace in the great room and jetted tub in the master bath. (Consider your must-have list fully checked off.) There’s a seasonal outdoor pool for your mini-splashers, and you’re steps from the award-winning 18-hole Thousand Hills Golf Course, rated “Best of the Ozarks” by those who know “best” when they golf it – the Branson/Springfield area locals. The carts are GPS-equipped, and if you’re missing your glove or just want a new shirt, check out the pro shop – it’s Branson’s largest. As a guest, you’ll receive free tickets to local theaters and attractions – just ask at the front desk. And don’t miss out on local shopping, dining, hiking and water sports on gorgeous Lake Taneycomo. - Front desk is open 7:00 AM-10:00 PM Sunday-Thursday and 7:00 AM-11:00 PM Friday-Saturday. Guests that are planning to arrive outside normal front desk hours must contact the property in advance using information on the booking confirmation to receive codes to lockboxes.